Our best selling Teller Information Display in a drive-up window configuration! Each insert is made from black acrylic with surface printed copy. Acrylic channels with double sided adhesive are provided for window mounting. Once the channels are in place, the inserts slide in easily through the top. 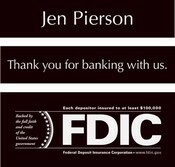 Display FDIC or NCUA logo, "Thank You" message, and even teller name with the three insert model. Select "Thank You" message option "Thank you for your business" "Thank you for banking with us"